If you are aware of this feature, do you still recall how do you know about it? If you doesn’t know about it, you are not alone, and it’s not your fault. I owned an Apple iPad for more than a year before I got myself an iPhone 4S, therefore I am aware that there is an undo/redo feature for typing in iOS. When I got my iPhone, I am pretty excited and start taking notes using Pages while reading Donald Norman’s The Design of Everyday Things, and I started looking for a clue to undo my wrong Paste action. As you would expect, I failed to find any single clue until I searched on the internet for the activation method. The user needs help. Just the right things have to be visible: to indicate what parts operate and how, to indicate how the user is to interact with the device. Visibility indicates the mapping between actions and actual operations. Whenever the number of possible actions exceeds the number of controls, there is apt to be difficulty. So my suggestion to this design issue? Make it visible! Just one Undo button at the Advanced Symbols layout will really helps a lot. Long press it to access the Redo option (if applicable). 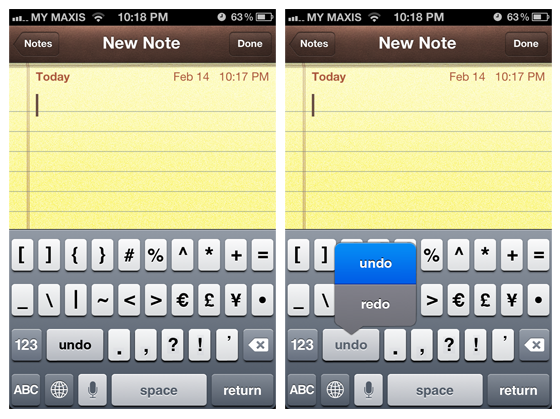 Why this solution can be a much better option compared to the ‘Shake to Undo’ feature? It’s because even though now I already know shaking the device can activate this Undo/Redo feature, but I just doesn’t want to do it in public and look stupid. I couldn’t agree more. I find it very annoying to have to sake my wrist over and over to do multiple undos it is such a poor implementation I can’t believe it is still there only solution. Most people discover this I would think accidentally I know I did. 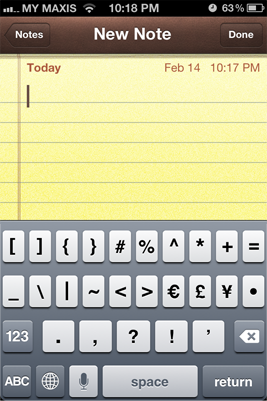 I wonder if ther is a jailbreak tweak for this. Your solution isn’t much better. You’re hiding the functionality. Thanks for the comment. I admit that it wasn’t the best solution, but at least it won’t get activated surprisingly. iPad is having the similar buttons in the keyboard.